These wallets have interior dividers made from game-used MLB jerseys. 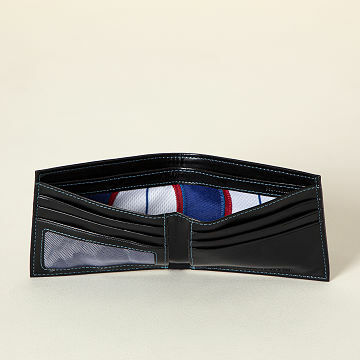 With an interior divider made from a game-used jersey from your choice of MLB team (we've got 'em all), this wallet is a fun, functional way to carry your fandom with you wherever you go. Each piece of baseball history is hand-cut and selected to feature at least two colors of the iconic uniform. Having come right off the field in a regular season game, the fabric shows varying amounts of authentic wear. The divider helps organize your cash, a mesh pocket holds your I.D., five interior slots keep credit cards handy, and your favorite team's name debossed on the front adds home run appeal. Handmade in India. Officially licensed by Major League Baseball, each wallet includes a tamper-evident hologram sticker on the uniform piece to ensure authenticity and comes gift-boxed with an authentication instruction card. I bought this for my husband who is a lifelong Cubs fan. I found this wallet and took a chance that it would be the right size and good quality. It is perfect! The size is just right, quality seems to be excellent and it has some cool details I didn't notice right away. It's embossed with "cubs" on the front in small enough letters to not be obnoxious and it has Cubbies blue stitching!! My husband LOVES it. He showed it to a co-worker the day after he got it and she immediately ordered a Mets wallet for her husband. Really cool product. Highly recommended! Great quality wallet with sleek design. It was a very special gift for my special sports fan. It has a great look and made with an authentic uniform. My husband loved being able to look up the specific jersey the wallet was made from. Great quality and style. Definitelty a successful birthday gift! The concept of using Yankee uniforms was great. The look and feel of the wallet is excellent. Perfect Gift for any Baseball Fan! This wallet is a perfect size! Very sleek! I love the uniqueness of this wallet. My only disappointment since I was giving it as a gift, it lacked an obvious description of what it was made with, the used jersey. Perhaps a letter, explaining how it was made and an explanation of it's authenticity. The small card inside the wallet can be missed in the excitement of opening presents ;-). This was a very cool unique gift!